One of the mistakes within the Ichnographia Campus Martius where details of two separate plates do not match up. This particular mistake occurs within the Horti Neroniani. After seeing how the figure captions are inverted with regard to the Ichnographia and the Nolli Plan in the Peter Eisenman section of Autonomy and Ideology, it reminded me of the other mistaken inversions that I have found in other texts on the Ichnographia. For example, the east/west and other mistakes (Equirria and Antoninus Pius) of Fasolo, the mis-characterization in the Ichnographia-Jerusalem essay, the mention of inversion in the Allen essay, and my own mistake about the direction of the Triumphal Way. I find these mistakes to be uncanny, as if the Ichnographia had the power to confuse anyone who studied it (and here I can quote Kreiger). "Rome's Campus Martius suggests an impossible tension among competing parts, perhaps even anarchy. The engraving itself seems to pulsate and change patterns as one studies it." The strange thing is that Piranesi seems to make the same kind of (archeological) mistakes. ...Piranesi actually made a few delineation mistakes, e.g., the late(?) inclusion of the Circus of Caligula and Nero and the patch of grass between two of the plates. The Porticus Vipsania, like the Porticus Alexandri Severi and the Naumachia Domitiani, is one of the buildings along the Ichnographia's Equiria that represents an actual ancient Roman building, however Piranesi situates the Porticus Vipsania further north than its true historical location. The real Porticus Vipsania was within the Campus Agrippae along the Via Lati, close to the Pantheon, and not within the northern region beyond the Aurelian Wall as Piranesi shows it. 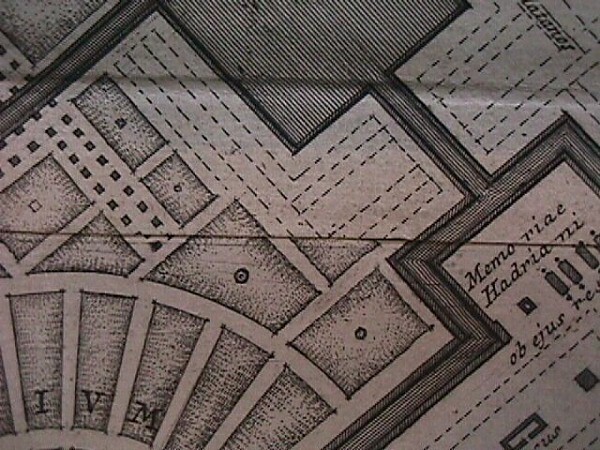 For modern archeologists, the Porticus Vipsania is interchangeable with the Porticus Polae, and, adding further to the confusion, Piranesi delineates a separate Porticus Polae directly in front of the Pantheon. Needless to say, the inaccuracy of Piranesi's portrayal of the Porticus Vipsania is just one example of why the Ichnographia was never taken seriously as an valid archeological reconstruction. Piranesi's Porticus Vipsania does follow an internal logic within the overall scheme of the Ichnographia Campus Martius, however. It is situated alongside the Equiria, together with the Porticus a S.P.Q.R. Amoenitati Dicata and the Porticus Alexandri Severi, to accommodate the many spectators of the Equiria, the annual horse races in honor of Mars. Furthermore, the Porticus Vipsania sits at the head of a valley which contains the Sepulchrum Julii Caesaris et Drusi and the Sepulchrum Agrippae, thus adding still more to the porticus' civic importance. Even though Piranesi dislocates the Porticus Vipsania, he nonetheless positions it within a fitting symbolic context, and this wilfullness on Piranesi's part, moreover, is indicative of the widespread pattern throughout the Ichnographia whereby Piranesi's archeological mistakes are simultaneously discerning symbolic acts often with narrative intentions. As to the double nature of Piranesi's delineation of the Triumphal Way, my take on what Piranesi did is that he purposefully made/designed it to be both pagan and Christian because that is exactly the history of the Roman Triumph. Piranesi knew the whole history, and he cleverly rendered all of it within the Ichnographia. What appear to be mistakes within the Ichnographia are more sign-posts of issues to pay closer attention to.